Are you planning on gathering your best group of mommy friends for a fun night in? 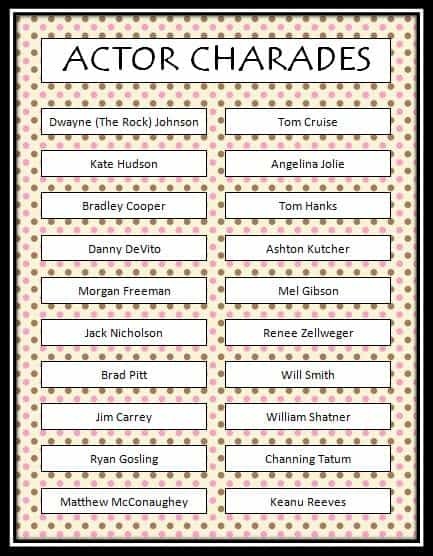 This free printable Actor Charades game is a fun addition to a movie night or an awards show party. Click here for the free printable. Simply print the actor charades, cut out the charades and place them in a bucket. Split your group into two teams. The first team will choose one person as the actor. This person will pick a charade out of the bucket and will quietly think of ideas for acting out this charade. The person will then have 1 minute to act out the charade while her team tries to guess the answer. Remember, no talking or singing in charades! If Team A guesses the correct charade, they earn a point. If not, then Team B gets one guess at the correct answer to earn a point. The game then continues with Team B taking a turn at choosing a team member to act and selecting a new charade out of the bucket. Think about movies these actors have been in and try to act out a popular movie title or scene. Does this actor have a signature look (hairstyle, tattoo, etc.)? Does this actor have well known personality traits that you could act out? Has there been any celebrity gossip on this actor that you could act out? Is this actor known for a signature saying? Is this actor married to someone famous that you could add into your charade? You could also award an added bonus point if the team can name 5 movies this actor has been in within 10 seconds. Stay updated on the latest fun ideas and freebies by following along on Facebook, Twitter, Pinterest and Bloglovin’. Of course I may be the only one but Charlie Sheen is still my favorite. I wouldn’t do very well at this one, as I don’t really know much about celebrities. Your suggestions are good, but I bet I would draw a blank. lol!